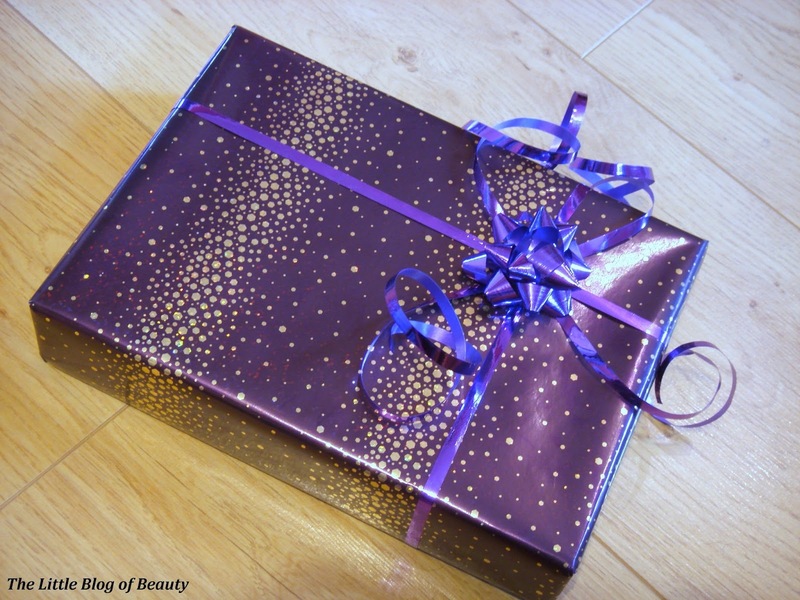 In a recent #bbloggers chat I asked if anybody would be interested in a post showing how I wrap my Christmas presents and the general response was 'Hell yes, I'm rubbish at wrapping presents! ', so here it is! 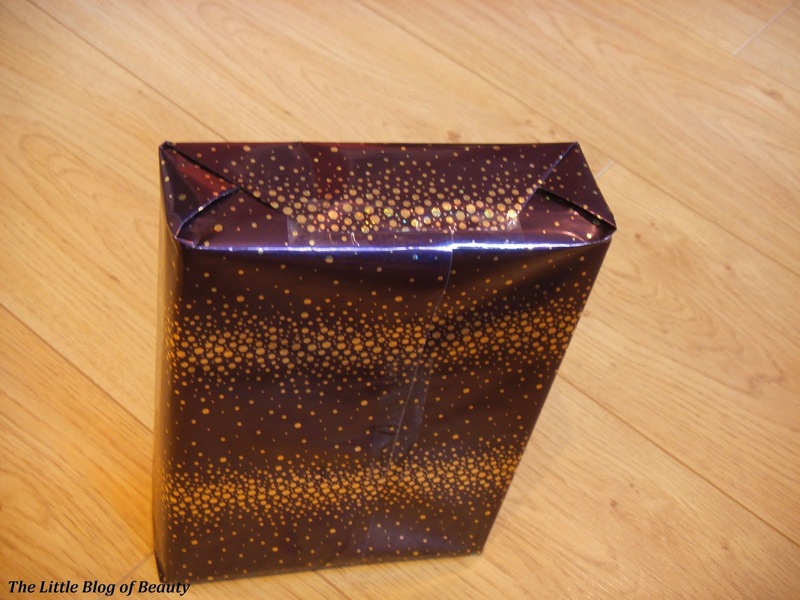 I'm a complete perfectionist in most things, and especially when it comes to wrapping presents, so I think that's probably why I've managed to to perfect my wrapping technique. I'll be showing you what I do step by step which I hope will help. 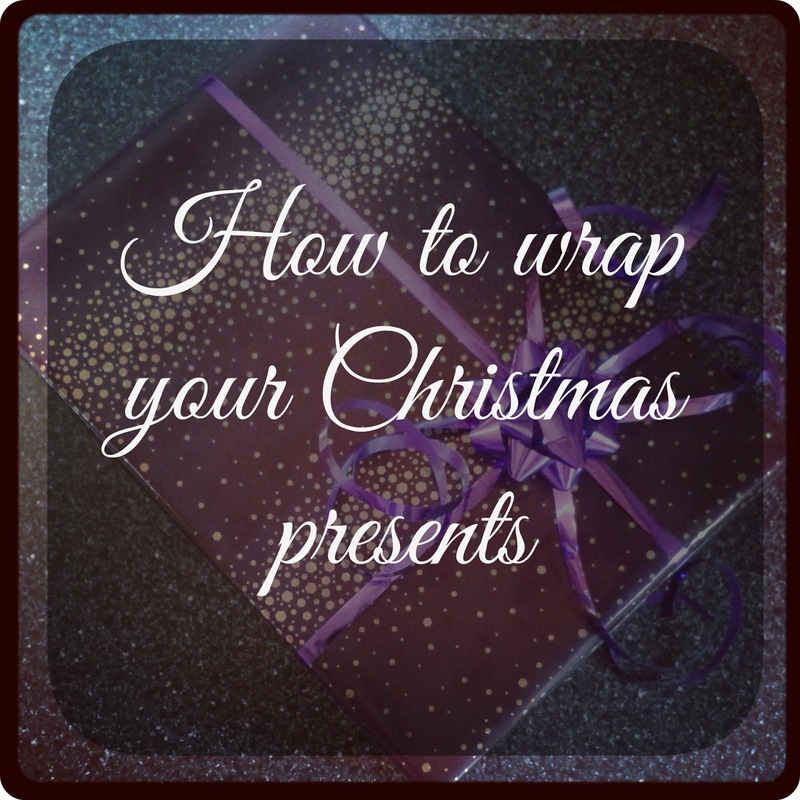 I'll also be including tips along the way to try and help make wrapping your presents easier. I'll begin with a couple of tips. Tip 1 - Whatever the present is, try and put it in a box. Whatever your present is it will more than likely be easier to wrap if you put it in a box, if it doesn't already come in one obviously! This can be some kind of gift box, just a plain cardboard box or even something like a toaster box. It's always quite funny watching somebodies face when they unwrap what looks like a home appliance until they check inside the box. Both me and my mum hoard good quality boxes throughout the year and shove them in a cupboard so they're there ready for boxing presents. Tip 2 - Prepare pieces of sticky tape ready. Before you start make sure you cut some pieces of sticky tape to length and stick a small part of one end to the edge of a table or other piece of furniture. This means while you may have one hand holding a piece of wrapping paper in place you have tape ready to use and easily accessible. I know you can get those little tape dispenser things that either sit on the table or that you can attach to your hand but they're not always easy to use one handed so I don't bother with them. To begin with you need to cut your wrapping paper to the correct size for wrapping your present. 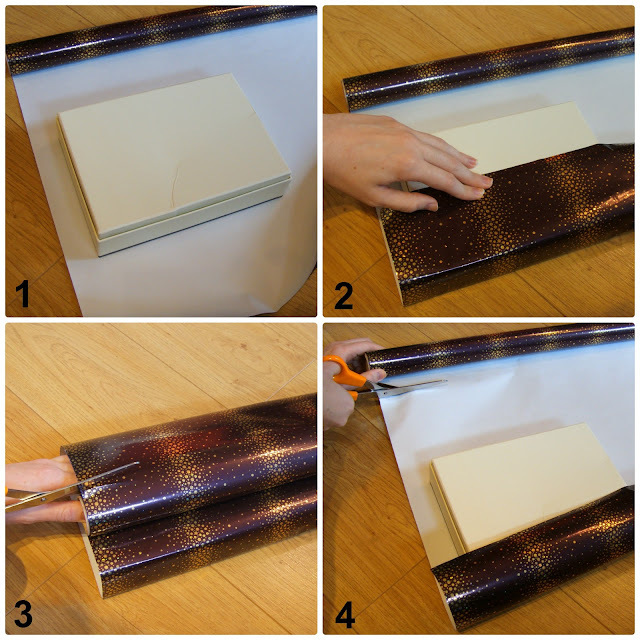 Unroll the end of the paper and place your box on the paper (1). I always place my box on upside down so the join of the paper is on the bottom of the box. You then need to pull the end of the paper over the box to make sure you've left enough paper to reach at least half way over the bottom of the box (2). 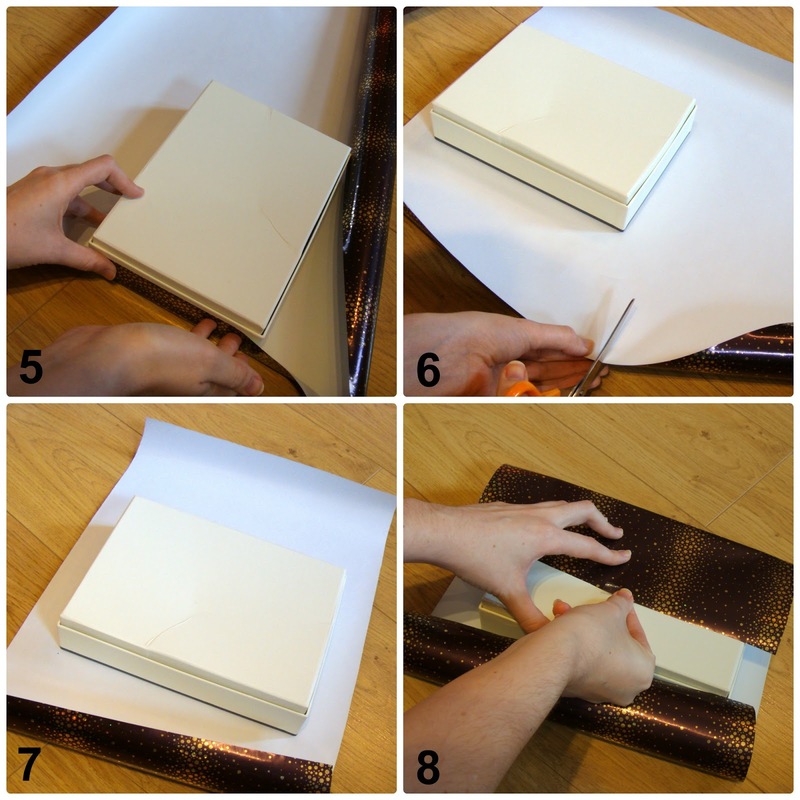 Then lift up the roll of paper and place it on top of the box (3). Make sure there's enough paper to reach slightly overlapping the first piece of paper and make a cut in the paper. 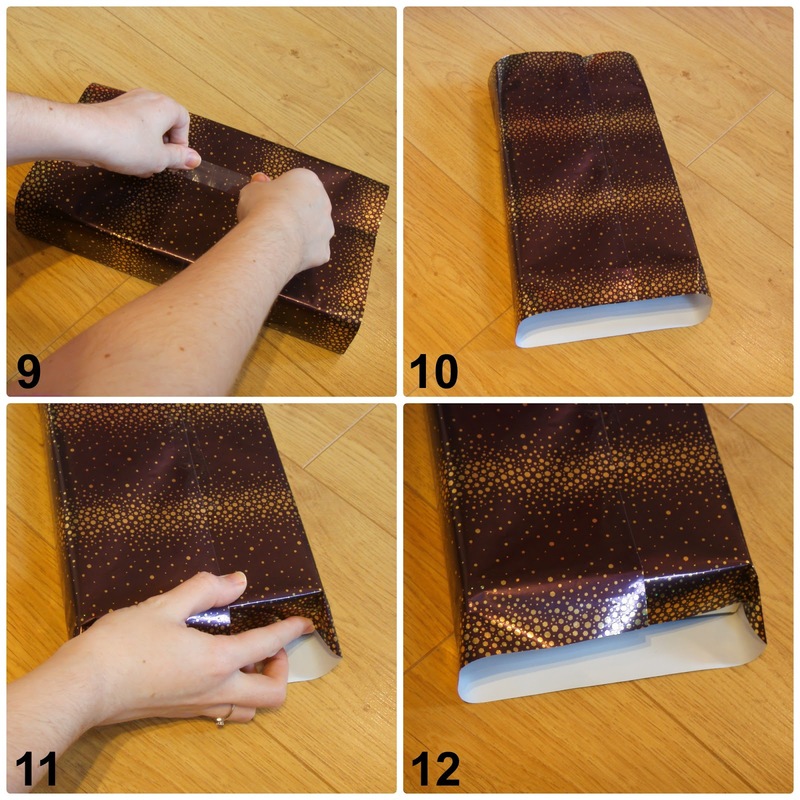 You can either then cut along while it's still on the box using the roll or even the pattern on the paper to help guide your cutting or you can place the roll back down on the floor and cut along with it resting on the floor (4). Next you need to trim your paper to size the other way round. To begin with move your box towards the edge of the paper and make sure there's enough paper there to reach at least half way up the side of the box (5). Then on the other side of the box where you have excess paper make sure you leave about the same amount of paper as you have on the other and trim the paper down to size (6). It's better to be a bit more generous here then skimpy as you can always trim a bit more off if there's a bit too much paper there. You should then have a piece of wrapping paper the perfect size for wrapping your box (7). Picture 8 then leads me on to my next tip. Tip 3 - Don't be afraid to use small pieces of tape to hold paper in place. If you struggle with trying to hold one piece of paper in place while you fold the other piece over the top and try to secure with tape then just secure the first piece in place with a small piece of tape. If you're worried about the tape ruining the box/present just make sure you use less sticky tape. You can get tapes that are more like masking tape but clear, so when they're pulled off they won't rip anything. So once your piece of paper is the right size you can either pull one of the longer sides over and secure with a small piece of tape or hold it down while you pull the other side over the box to overlap your first piece of paper and secure with a strip of sticky tape (9). Two sides of your paper are then secure (10). You then need to make a start of the edges which are much more difficult to try and make neat. Move your box round so one open end is facing you and begin by pushing in one corner of the paper down until it meets the edge of the box (11). You may want to hold the other end of the box with your other hand to stop it sliding along the paper as you're pushing against the box. This is less of a problem if you've tapped some paper to the box but can still happen slightly. If you then run your finger over the paper from the corner of the box towards the edge of the paper you'll make a crease that should hold the paper in place (12). Then repeat on the other side (13). 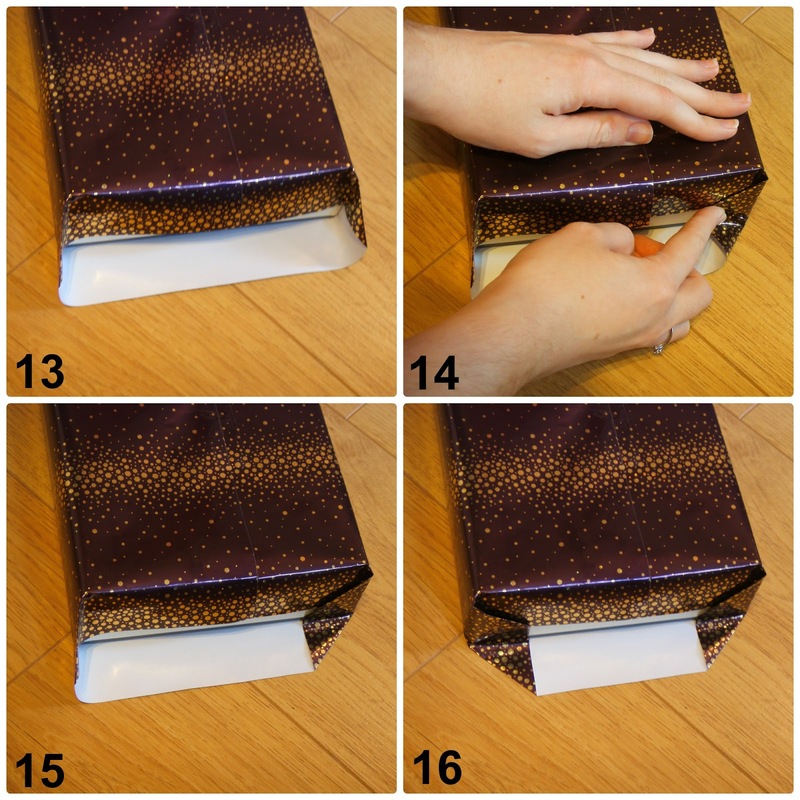 Where you've folded the wrapping paper over and made a crease you then need to take the outer point of the crease and pull it down towards the base of the box (14). When the paper is flush along the bottom of the box run your finger along from the bottom corner of the box along the paper to make another crease that should again hold the paper in place (15). Then repeat again on the other side (16). What I then like to do is, keeping the bottom edge on the floor so the paper folds over neatly as you do it, bring the box up so it's standing on it's side (17). This is because if you fold the paper up to meet the box and secure with sticky tape while the box is still flat on the floor you risk the box slipping through the paper making it difficult to try and wrap neatly. If you tip the box up this means the box is sat flush against the paper on the floor. 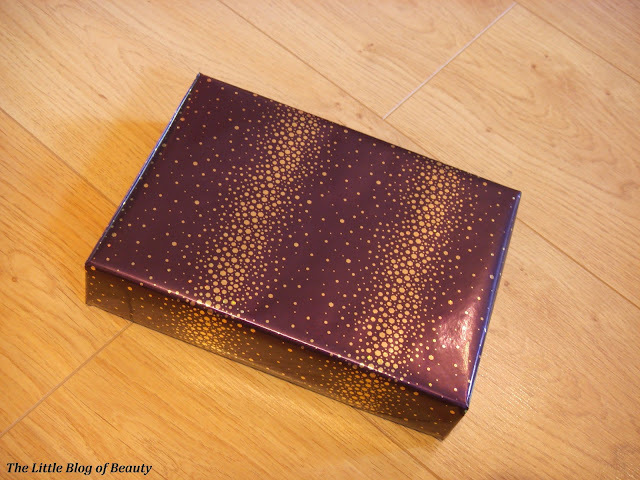 While the box is up on it's end, making sure the bottom of the box is facing you, you then push the two corners of the paper closest to you down to meet the edge of the box and make your creases again (18). You then pull the outer points of the creases down so they are flush against the edge of the box furthest from you and secure with your creases again (19). The flap of paper that's left you then pull down tightly over the edge of the box and secure the edge of the paper with sticky tape (20). Then just flip the box over and stick down the other flap. The box is then perfectly wrapped and it's time to decorate. You can get various different types of ribbon's and bows to decorate presents with but I've gone for the pretty standard curling type ribbon and a simple small bow. 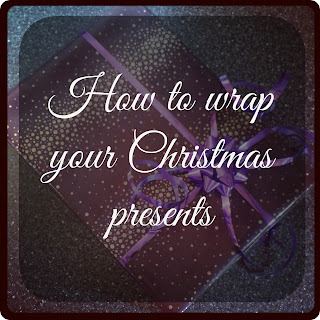 Tip 4 - My next tip is not to wrap the ribbon round the box one way and then twist the ribbon round to wrap round the box the other way as you'll be left with a bump where the ribbons twist round each other and your box will not sit flat. 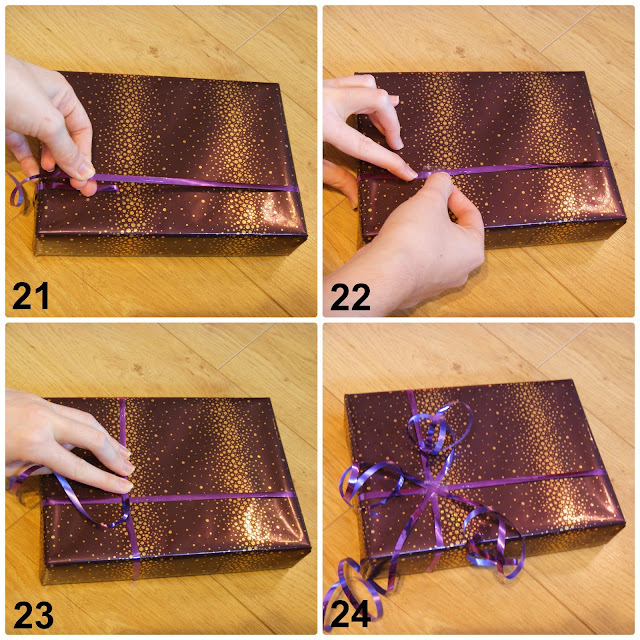 Start by wrapping the ribbon round and cutting the ribbon to size ensuring there's at least a centimetre overlap so the ribbon can be secured (21). I then decide where I want the join to be on the top of the box (don't worry that it's on the top) and secure the overlap with a small piece of tape (22). I then repeat the same going the other way round the box and secure over the top of the previous piece of tape (23). You can then stop here if you wish or you could add some curly ribbon. If you're using the type that comes wound in a kind of squashed ball then it should already be curly or you can make it curly by running the ribbon gently between your thumb and the edge of a pair of scissors. All you need to do is cut a long length of ribbon and just secure the middle of it down flat diagonally over the point where you've already applied tape to secure the other bits of ribbon (24). Then secure another piece diagonally the other way. The last finishing touch is just to stick a bow over the point where everything joins to hide the sticky tape. You then have your completed present! I hope this hasn't been too hard to follow, I tried to describe the steps as simply as possible. 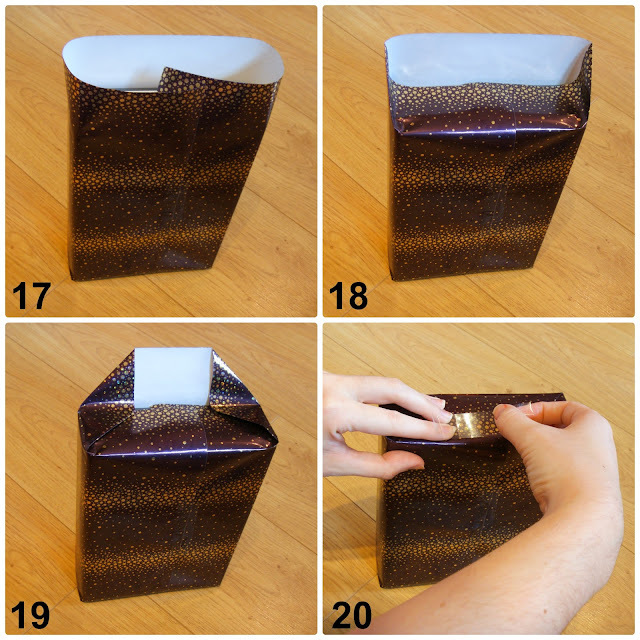 I hope you have found this useful and have fun wrapping your presents. Great post! I love wrapping presents, I find it relaxing! This is much needed tutorial for me! My presents always look like a child has wrapped them, I might try a bit harder this year to make them look as pretty as this one! !